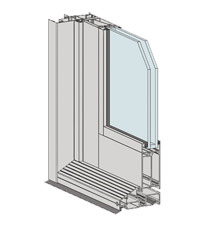 The Series 729 is a high performance thermally broken aluminium door delivering excellent thermal outcomes. The Designer Series ThermalHeart™ range has been designed with flat faces for a clean, contemporary look. In this respect it mirrors the design approach adopted for standard Designer Series products. Corners have generally been squared off, with externally applied glazing beads also following a square, rather than sloped, shape. We offer both external and internal opening hinged doors designed to complement our other Designer Series Thermal HEAT™ products. Series 729 incorporates Thermal HEAT™ technology giving a true wide thermal break between the outside and inside faces. WERS (Window ENERGY Rating System) data shows that using the same IGU in a Thermal HEAT™ awning is 32% more efficient than a standard non-thermally broken window. A major advantage with Thermal HEAT™ in cold climates is the reduction in internal condensation. Thermal HEAT™ is also suitable for hot climates. It takes more energy to cool a home in a hot area compared to heating a home in a cold climate zone. We offer Thermal HEAT™ in a range of stocked colours including dual colour ClearMIST™. The doors have been tested for compliance with the relevant Australian Standards and achieved a high water resistance of 380Pa for external swing doors and 150Pa water resistance for internal opening doors, this makes the product suitable for most residential applications. The extra strong door facilitates over size door panels. Doors can be fitted with a variety of custom lever sets (ICON™ or MIRO™) with Lever Compression Lock (LCL) motor as standard. ICON™ lever sets are available in 316 Stainless steel finish.